“They don’t teach that in seminary.” A minister’s whole career could be summed up with that sentence. Seminary fills a person with a lot of knowledge. But somewhere between eschatology and soteriology, the Nicene Creed and the Barmen Declaration, aspiring ministers aren’t taught what to do when a market crash wipes out a church’s savings or a tragedy brings reporters camped out on the sidewalk. Enter 99 Prayers Your Church Needs [But Doesn’t Know it Yet]. Austin Channing Brown’s I’m Still Here: Black Dignity in a World Made for Whiteness was released this year and I commend it to you. Brown’s memoir is essential reading. Especially Christians who are white and living in the United States will benefit from listening to Brown’s wisdom and perspective as a woman of color. Her absorbing book starts with a surprising story that immediately draws the reader in: Brown describes an encounter she had at the age of seven when the librarian was suspicious and questioned whether the library card actually belonged to this young Black girl. When Brown confronted her mother afterward, her mother confessed that she and Brown’s father had intentionally chosen a name most typically given to a white male, because they hoped that potential employers in the future would give “Austin” a chance not normally extended to people of color. After this powerful chapter, Brown tells her story chronologically. She describes attending a private Christian elementary school in Toledo, visiting extended family in Cleveland, and she shares experiences—both positive and negative—with teachers at her Catholic high school and majority-white college in Chicago. After graduating, Brown worked at a number of Christian non-profit organizations. Brown is someone who is well acquainted with white evangelical culture, and she writes with persuasion and spiritual strength. Going into the working world after college, Brown admits that she had assumed that she would be able to fearlessly combat racism, slaying racist nonsense as if it were a dragon. What she discovered, however, was that racism was not so much an “imposing beast” but a “poison” that “seeps into your mind, drip by drip, until it makes you wonder if your perception of reality is true.” My guess is that many young clergywomen could resonate with this experience. We may enter a ministry with idealism and a desire to effect change, but systems that oppress continue to oppress, and others undermine our truth at every turn. Every time we seek to name the problem, we are told that the problem is with us. It can be wearying. A well-hosted dinner party is a work of diligence and artistry. Even leaving culinary gifts aside, strategy and insight go into cultivating the guest list, arranging seating, introducing new topics of conversation, drawing guests in and lifting up the commonalities and unique expertise around the table. By the end of the evening, all the guests feel well-fed, not just by the content of the meal but by the characters around the table. In Solus Jesus: A Theology of Resistance, authors Emily Swan and Ken Wilson invite the reader to a sumptuous 3-course feast around a table filled with friends both familiar and yet-to-be-made. First, let me introduce you to our hosts. Emily Swan and Ken Wilson co-pastor Blue Ocean congregation in Ann Arbor, Michigan. Their story of leaving the Vineyard (charismatic, evangelical denomination) congregation where they previously served (a church that Wilson himself planted) folds into the content of the book. Swan’s approach is shaped, in part, by her experiences as a missionary in China, by her wide range of reading interests, particularly theological voices from the margins and by her own story of falling in love and coming out as a queer woman. Wilson’s contribution to the text is shaped by his interest in mystics and patristics, his own experience of bereavement in the loss of his wife and by his evolving conviction regarding the full-inclusion of the LGBTQ+ community within his native evangelical Christianity. In this book, our hosts prepare a three-course meal. First is the premise from which the book derives its title: “It’s enough to say a living Jesus is the final authority in Christianity.” (15) Rather than the doctrine of “sola Scriptura,” what if the church were led — now and always — by Jesus as revealed in Scripture and experience, in other words: “solus Jesus?” To this end, the authors introduce readers to Jewish scholarship, early church and recent church history—especially some of the finest work within their own charismatic, Pentecostal tradition—to prove the validity of experience as a teacher. One wonders if Martin Luther himself might agree with the authors’ premise as he never intended Scripture to be interpreted outside the received and living tradition of the church. The second, most filling, course offers up an opportunity to investigate more recent theological understandings of the work of Jesus Christ on the cross. Rather than penal substitutionary atonement, where the primary work of the cross is to satisfy the wrath of God in God’s own son, scapegoat theology teaches that to look to the cross is to see all those who have been cast aside, misunderstood and crucified by our world’s insatiable demand for defining who’s in and who’s out. In a uniquely Christian response to hate, understanding Rene Girard’s view of Christ as victim on the cross allows us to gain a new lens by which to value and to stand in solidarity with all those who are victimized in our world — and our churches — today and, in particular, those LGBTQ+ members of the Christian family. The third course is the richest option, in which our hosts ask us to act according to the theological convictions laid out in the previous two courses. Again, pulling from a wide range of sources, our hosts ask us to consider this question: “What if we could learn to step away from the magnetic pull of rivalry and learn to be with each other differently?” (321) In a startling last chapter, our hosts leave us to consider the implication of a “non-rivalrous Gospel” amid other world religions. Throughout each course, our hosts draw out the other guests around the table: their own Pentecostal tradition, Dietrich Bonhoeffer, James Cone, Rene Girard, Jewish midrash, Tibetan Buddhism, Eastern Orthodoxy, inviting each to interact with the hosts’ and readers’ own stories of faith. In this way, the authors of the text model their own thesis—a wide welcome in solidarity with Christ who identifies himself on the cross with all those who have been excluded from invitation in the past. If I could be afforded one quibble it would stem from my own Calvinist-Reformed theological conviction, of which the authors write, “It’s difficult to picture solus Jesus taking root in churches tied to sola Scriptura as their institutional narratives (the Calvinist-Reformed and Lutheran sectors, in particular. )” (362) In fact, a notable exclusion from this book’s guest list is Karl Barth, the 20th century’s greatest Calvinist-Reformed thinker who wrote, precisely, in favor of the centrality of the Word-made-flesh rather than the word of holy writ. This is why, in many Reformed congregations today, you will hear the reading of Scripture prefaced not by “Listen to the word of the Lord” but, rather, “Listen for the Word of the Lord.” Surely there is some collegiality between Barth and the authors of this text. I would have delighted to hear his voice afforded a greater hearing at the table. It is probably safe to say that this book is not for straight-ticket theological voters. Each voice around the table deserves its own consideration and, whether you are coming from the hosts’ own evangelical charismatic background or not, you will have opportunity to re-evaluate your tradition’s certainties and to wonder about the wisdom just past the borders of your own theological construct. I’m struck by both the patience and the impatience of this book — arguing their case with urgency but rarely brushing off those who disagree — struggling to make the circle wider in a way that does not attack but that comes alongside. In this way, it reminds me of another host at another table who invites us to come, to partake, to remember and to believe as part of a community that is not made by our own choosing. My biggest fear is being separated from my children by death. To miss moments like that one, or the feel of her hot breath on my neck as she naps on my shoulder. To no longer feel the weight of my son as he barrels at me as fast as he can with joy and excitement when I come home from work. The feared absence strikes without warning: in moments of utter bliss as I watch them sleep or moments of the unforgettable mundane as we prepare for school in the morning. There is something (to borrow from Glennon Doyle Melton) “brutiful” about watching your worst fear played out in print. Brutal and beautiful: this is Kate Bowler’s book Everything Happens for a Reason: And Other Lies I’ve Loved. Bowler captures the reader with honesty, humor, and raw emotion as she dives into her story: how to live life in the midst of dying; how to love others when you’re about to say goodbye. I still remember that gathering in a hotel meeting room in Kansas City. The NEXTChuch conference had just ended, and a group of pastors gathered to learn about Improv and how it could impact our ministries. Our speaker was snowed into her hometown, and the leaders began to change their plan. Yes, we were going to improvise a 24-hour workshop on improvisation. Throughout our sessions, as we played and then debriefed, I kept asking for the rulebook, the place where I could read about what we were doing to understand it better. MaryAnn McKibben Dana was one of those facilitators, and she very patiently kept reminding me that she was in the process of writing the book for which I hungered. Confession – I’m a pastor, but I’m not great about reading the Bible with my kids. Maybe it’s because it feels a little bit like work. Maybe it’s because I’m just too tired at the end of the day. Maybe it’s because my kids whine, “Ugh, it’s not even SUNDAY.” Maybe I just know too much about the Bible so when I read the stories I can’t just let them lie – I have to explain and give context. I want to emphasize certain plot points and draw out the untold stories of women and girls. I hope to ask good questions that help them hear the overarching story: God loves us. God loves all creation. God is faithful, even we are not. I know too well that many of the classic children’s stories can be – or should be – quite disturbing. In “Noah’s Ark” everybody on earth dies in a flood. In the story of Joseph, his brothers sell him into slavery for being a brat. Even the central story of our faith – the cross and resurrection – can be traumatic for young ears and needs to be handled carefully. As a church professional I own a LOT of story bibles. The Spark Story Bible is my favorite for reading in worship because it’s close to the text of the NRSV but tells stories in an engaging way and has (non-Eurocentric) illustrations which add feeling, meaning, and depth to the words. The Deep Blue Bible Storybook is my favorite bible for parents because it has great study notes that will help parents as they read to their kids. It’s kind of like a parent study bible. The Jesus Storybook Bible is lovely for weaving the scriptures into an overarching narrative which can be really powerful for adults and older children. While these are all excellent works that I highly recommend, they still leave me wanting – especially for a story bible for young children (their intended audience). Growing in God’s Love: A Story Bible is the Bible I want to read to my children because it feels like it’s written in my voice. The authors of these re-tellings are my colleagues, trusted pastors, chaplains, educators, and even a rabbi. These faithful practitioners of children’s ministry tell the story for kids, offering context and language that suits their understanding. Each story ends with questions and encouragement to Hear, See, and Act in a way that deepens understanding for children. And, sure, adults can get a lot from reading this bible to their little ones, but it’s written perfectly for preschool and early elementary kids who think concretely and struggle to understand metaphor and symbolism. In order to help parents choose a story that might be helpful or interesting for a particular child or situation, the editors chose to forgo the traditional order of the books of the Bible and group the texts thematically with headings like Beginnings, Prophets, and Listening for God. For example, the Rivalries section has the stories of Hagar, Sarah, and Abraham as “A Family With a Big Disagreement” (Gen. 16:1-16) and “A Family Changes Its Shape” (Gen 21:8-21). While this may throw the biblically literate a bit off-kilter, it is still grouped into the two testaments and follows the basic flow (with a helpful scripture index in the back). The illustrations vary in style, but all are beautiful, and the majority are non-Eurocentric. When I think of my own childhood, I remember playing barefooted in the backyard with my sisters. I remember planting pumpkin seeds beneath our jungle gym, that eventually grew into a reaching vine, stretching for the house. I remember an idyllic, safe childhood. 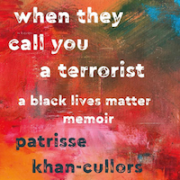 This is not how Patrisse Khan-Cullors’ work, When They Call You a Terrorist: A Black Lives Matter Memoir, describes hers. Her childhood was defined by terror. Love, too, but the terror was most haunting for me as a white person reading this book. You see, her memories include the normative regularity of her brothers being harassed by the police and arrested. Her memories include being handcuffed in front of her school class at the age of twelve for suspected drug use, even though no drugs were found on her. Her memories include attending a gifted middle school, and befriending the daughter of her slumlord, the very man responsible for the year her family did not have a working refrigerator in their apartment. Hers was a childhood marked by pain and trauma, yet at the same time, vibrant life and fierce love: the love of siblings who care for each other, the love of a mother who works damn hard to feed her kids, the love of a father who claims her even though she is not biologically his, the non-judgmental love and honesty of her biological father, the love of friends who become family to her. While Khan-Cullors and I both experienced deep love in our childhoods, the contrast between my sheltered childhood and her terrorized childhood is one example of the painful difference between the experience of being a white person and being a person of color in the United States. Perhaps this painful experience fueled Khan-Cullors’ powerful passion to later become one of the founders of the Black Lives Matter movement, and why her memoir, written with asha bandele, is a heartbreaking and inspiring call to action. When They Call You a Terrorist: A Black Lives Matter Memoir seamlessly weaves the particularity of Khan-Cullors’ story with sweeping statistics of brutality against people of color. This accessible tapestry breaks through the lies us white people tell ourselves about our individual responsibility and unquestioned assumptions of the “good” intentions of police officers. In particular, the story of her brother Monte’s struggle with schizoaffective disorder, his torture in prison, and inability to get proper care at home (even after calling 911), is a scathing exposé of the terror Black communities experience daily. The reader cannot help but notice that the title of the book is a reference to the Black Lives Matter movement being branded as a terrorist movement, even when it is they who are on the receiving end of terror. Khan-Cullors reveals how sheltered we white people are from our own complicity in terror (through raids, murders, prison systems, and the like), and she will not let us ignore or forget this any longer.